At Kentwood Ford, we believe in offering the best vehicles to our customers simply because you deserve the best! Ford’s hard work and commitment to innovation have allowed them to create one of the best trucks on the market: the Ford F-150. Read along to discover the top 10 reasons why you should own a Ford F-150! When I say aluminum, you might say “beer can.” But Ford’s new aluminum truck bodies are used in aerospace engineering, commercial transport, and the energy industry. Ford’s new military-grade aluminum is extremely lightweight. It shed 700 lbs. worth of weight from the previous year’s truck. The result? Ford’s trucks are more fuel efficient because they don’t need to lug as much weight around. The F-150 has truly herculean strength. 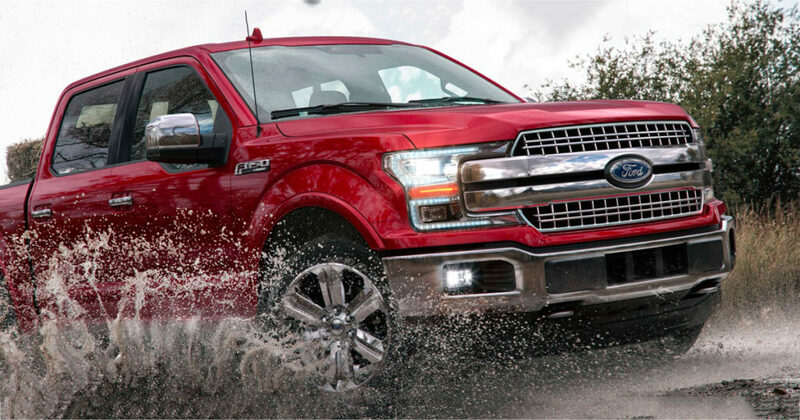 Thanks to the 3.5L EcoBoost V6 Engine, the F-150 can pull a maximum of 13,200 lbs. Even other competitors like the Ram 1500 don’t even come close when it comes to towing capacity. So, if you need to haul heavy tools and materials for work, you know that the F-150 is more than capable of the task. The current generation F-150 integrates high strength with less curb weight to have the best-in-class payload of 3,270 lbs. when properly equipped. The truck bed is also engineered to take a beating. To all work-minded potential F-150 owners,: the F-150 is designed to tackle any use and abuse. For many years now, the F-150 has received a scored high from NHTSA on all of their safety tests including rollover, frontal crash and side crash. Thanks to Forward Collision Warning, the F-150 is one of the safest trucks on the market. Those patents include Ford’s 911 Assist® (which automatically places a direct call to a local 911 emergency worker if your truck is in a serious accident), My Key, Ford Sync, Tough Bed, Ford Telematics, Side-Mirror LED Spotlights, Remote Tailgate Release, the BoxLink management system, and over 90 more. With the 2.7 L EcoBoost, your truck sips gas like an SUV while being a top performing truck at the same time. With 9.2 L/100 km on the highway and 12.3 L /100 km in the city, the F-150 is a great choice, even for penny pinchers. Backing up a trailer can be a real pain! But with the F-150’s trailer assist feature, you can do this easily. The Ford engineers have made steering simple, with a turn of a knob! Sound a little too easy? That’s because it is, activates the inconspicuous dial on the dash, put the truck in reverse, let go of the steering wheel and be amazed! The new F-150 has been tested over 10 million kilometres in a state of the art lab. It has been put through punishing terrain, Alberta-style weather, desert conditions, in high altitudes, all the while pulling heavy trailers and huge loads. Tests also included robots slamming its doors and tailgates, dropping massive amounts of weight onto the truck bed, all while being shaken and jostled from several directions! #10. BECAUSE YOU CAN GET A SWEET DEAL! Our in-house finance team can approve you for a car loan even if the banks won’t, while our insurance team can save you as much as 20% off what your current carrier is offering. You can also get $500 on your Go Card every time one of your referrals buys a vehicle at Kentwood Ford! Looking to test drive the new Ford F-150? Just send us a message on our website!